Fear not, because help is at hand! Wembley’s mouthy MC, Lady Sovereign, has taken it upon herself to save the hooded from extinction, by launching www.savethehoodie.com. It’s a ‘national treasure’, apparently. "If someone commits a crime it’s not about what they are wearing, it’s about the person wearing it, a criminal is a criminal no matter what they wear…Don’t blame the innocent hoodie, you should be able to wear what you want!" Point well made. Readers - support your local youths! 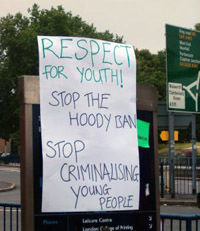 Head over to www.savethehoodie.com and sign the petition. Lady Sov promises to deliver it herself. You go, girl.